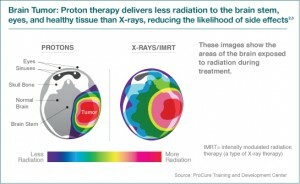 The key point of proton therapy is superior dose distribution, allowing physicians to precisely aim the highest dose at the tumor and avoid healthy tissues. Consequently, it shows many advantages over x-ray therapy. Proton therapy is especially appropriate for cancers with limited treatment options and those where conventional x-ray radiotherapy presents an unacceptable risk to the patient, e.g. eye or brain tumors, tumors close to the brain stem or spinal cord, etc. Proton therapy is also very much indicated for the treatment of pediatric tumors. As a child’s growth implies a constant high rate of mitosis, his cells will be as vulnerable to ionizing particles as proliferating cancerous ones. It is therefore crucial to aim the beams only at the tumor to avoid damage such as growth abnormalities, cognitive impairments, radiation induced tumors, cardiac damage, and other complications later in life. Merchant TE, Hua C, Shukla H, Ying Xiaofei, Nill S, Oelfke U. “Protons versus radiotherapy for common pediatric brain tumors: comparison of models of dose characteristics and their relationship to cognitive function”, Pediatr Blood Cance, 2008, 51, p. 110-117.